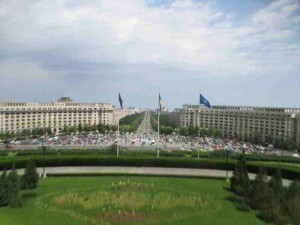 This is a view from the People’s Palace in Bucharest looking out over the Boulevard Unirii. The Boulevard Unirii has a length of almost two miles or 3.5 kilometers. What was supposed to happen when the boulevard and palace were built was that the Romanian dictator Nicolae Ceausescu would give a speech and the area in front of the building and all down the boulevard would fill up with cheering people. I’m sure it was a nice idea. Unfortunately for Ceausescu, the Romanian people tried him for crimes against humanity and executed him all within the space of about 72 hours during the Romanian Revolution. He never really got to use that great view to fulfill his dream. Some dreams are like that. This entry was posted in Travel and tagged Bucharest, Europe, Palace, View on June 13, 2014 by Steve.